If you're looking for a way to combine the cleansing, exfoliating, and detoxifying qualities of a salt bath with handmade natural soap, look no further than a "salt bar." Adjust the recipe so that it contains at least 70 to 80 percent coconut oil. The salt counteracts the lather of the soap, so the high coconut amount is needed to make lather. Some lesser amount of salt. Some soap makers will do 50 to 70 percent of the total oils and are happy with their bars. Unmold and cut the soap as very soon as it sets up, often in as little as 2 hours after pouring. The first thing to do is create the recipe you're going to use for the soap. For these bars to lather at all, you need to use a lot of coconut oil. Some simple recipes are just 80 percent coconut and 20 percent olive. Some soap makers feel more complex combinations of oils make better lather. Feel free to use your own mix of oils. As always, when you adjust or change an ingredient in your recipe, be sure to run the new recipe through a lye calculator. Mix your lye solution, measure and melt your oils, and blend the lye and the oils just like you would in any other cold process soap batch. Once the soap has reached a really light trace and you've added your fragrance or essential oil, it's time to add the salt. The three theories of salt addition tend to yield different results. Method #1 is the hardest and saltiest but has the lowest lather. Method #3 has the least salt but is the most like normal soap. Method #2 is a good balance of salt and lathering ability. There's no special technique necessary to add the salt, just dump it into your soap pot and start stirring vigorously. Pour or scoop the soap into your mold. It will be a lot thicker than your normal batches of soap. After you've poured the soap, it helps to tap/thump/slam the mold onto the counter to help dislodge any air that may have gotten trapped under the soap. The salt soap will start to harden almost immediately. If you're using a log mold, you'll want to cut the soap as soon as possible or as soon as its firm enough. The soap will still be warm even as it's going through the saponification process. 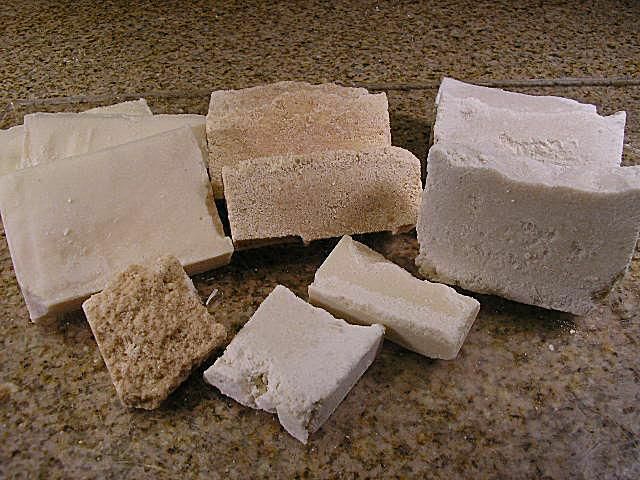 If you wait too long, the soap will be super hard, difficult to cut, and will result in crumbly bars. Another option for salt soap bars is divided slab molds or even single cavity molds where each mold holds one bar of soap. With the slab divider mold, be sure to line the bottom of the mold with freezer paper, otherwise you'll have a very hard time getting the bars separated from the bottom of the mold. With single cavity molds, you don't have to rush. Let the bars set and cool overnight. They should pop right out of the molds quite easily. Use regular, fine grain sea salt for salt bars. You do not want to use Epsom salts. The magnesium in the bars makes them gooey, sweaty messes. You can use pink, Himalayan, or other unique soaps as long as they don't have high "other" mineral content, like dead sea salt. You can add colorants and additives to salt bars just like other soap. You don't have a lot of time to manipulate the soap and it's going to thicken quickly. Some folks find that the salt seems to lessen the fragrance oil effectiveness. Enjoy this exotic and fun soap variety!